I love my new hutch, since giving our kitchen a makeover last month I’ve really had a great time decorating it, rearranging it, finding new little trinkets in the perfect colors to add to it (ok, I don’t get out much). But you know what has been the best part yet? Getting the hutch gussied up for Christmas! As you’ve probably noticed in recent posts like my Rustic Christmas tree, and my how to posts for Wreaths and Swags, my Christmas decorations tend to lean towards the traditional farmhouse look with vintage touches. 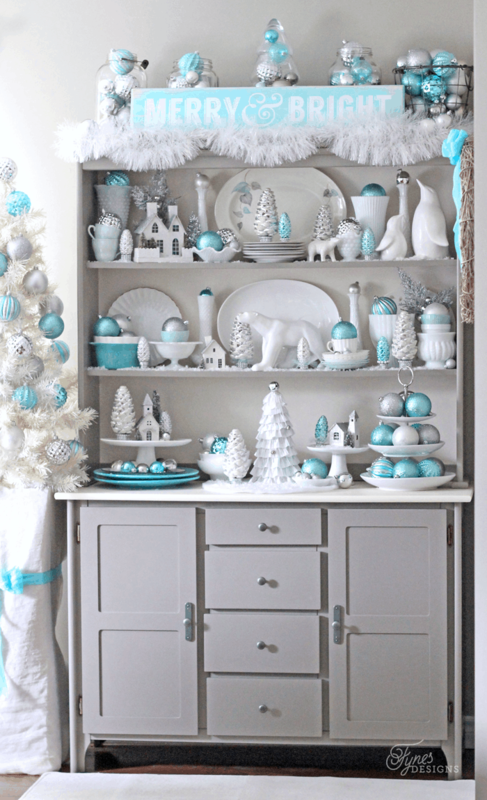 This Christmas hutch from Craftberry Bush is actually what I envisioned when I thought about adding Christmas elements to the hutch, but when I set foot in the Home Depot and came across the Martha Stewart Collection of bright blues and silver Christmas decorations I knew that is what I had to have to make my kitchen hutch pop this holiday season! I honestly got a little bit giddy when I found these pinecone ornaments. I love them as they are, but when I flipped them over I knew instantly they needed to be tiny trees. Aren’t these little ‘trees’ the cutest?! They are SUPER easy to make. Remove pine and ornament hanger from the pinecone. Hot glue pine cone ornament to the adapter by running a heavy bead of glue along the inside edge of the PVC adapter. For the smaller ‘trees’ you will need the smaller 6 pk. of pinecones and a 1/2″ PVC adapter. 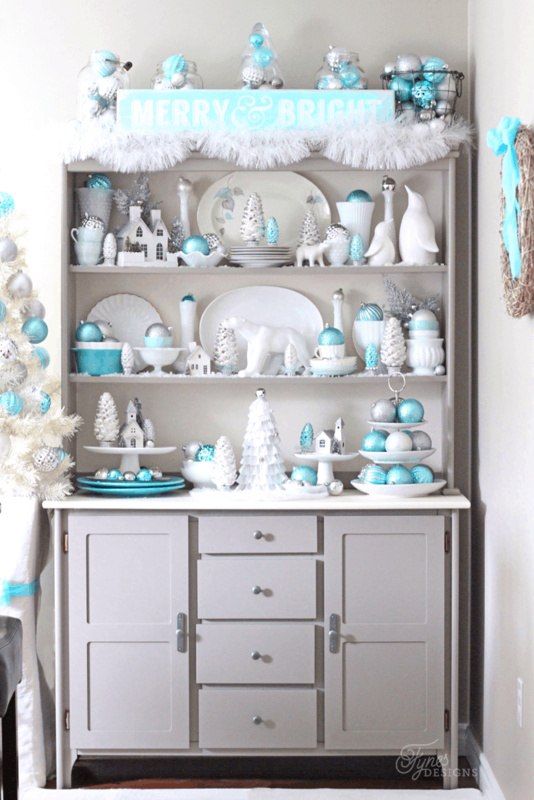 Styling a hutch is easy by combining elements you already have with new ornaments. Choose a color scheme- I went with blue, white and silver which co-ordinated well with the existing dishes, and a few things I had around the house. Add bulbs to a tiered tray and/or pedestal to add visual height- but don’t forget to go low too. Add in different size bulbs to bowls and tea cups to fill in the spaces between higher items. Add decorations around and on top of the hutch– I added a small white tree with bulbs and white lights to continue the decor to the whole corner of the kitchen. Plus, I balanced it by adding visually heavy items to the top of the hutch. Fill oversize jars with remaining bulbs (think pickle jars and wire baskets). A trick to make your bulbs stretch is to add grocery bags to the bottom of the jars that aren’t exposed and only add 5 or 6 bulbs to the top. I added a small painted sign to tie it all together. I purchased a 1 x 6 knotty pine board and painted it with leftover kitchen paint, then added a holiday phrase with vinyl stickers. Add a few Christmas lights So you can enjoy your decorated Christmas hutch even at night. 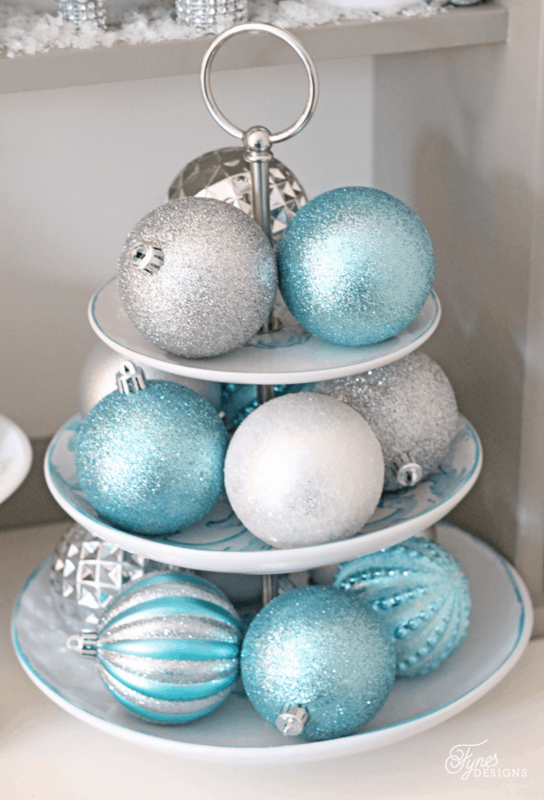 Use unexpected items like decorative holiday picks to add a little sparkle in otherwise empty areas. Have a healthy mixture of big and small items, at varying heights to draw the eye around the hutch. 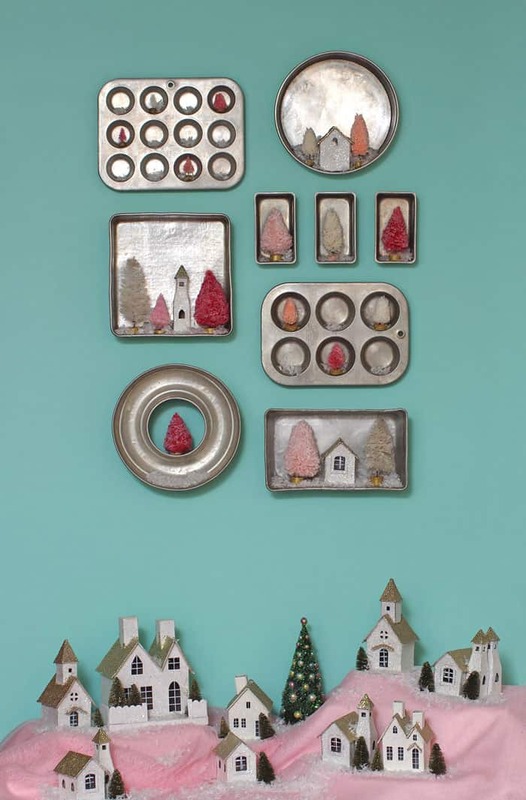 Make small groups of items to create a Christmas scene. Plus a small touch of fake snow makes it extra wintery. 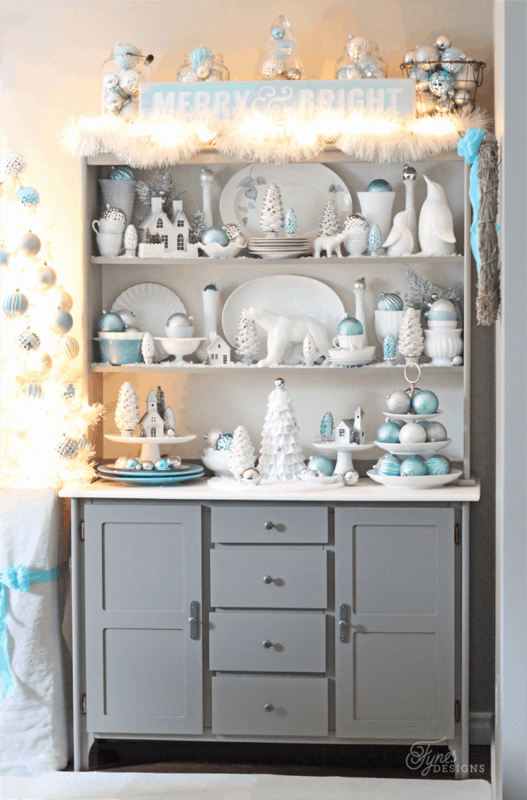 I hope you gathered some styling ideas to bring your kitchen hutch or vignette display to life this holiday season. Visit a Home Depot near you or shop online to find these ornaments and more! The ornaments for this post were provided by the Home Depot. As usual all ideas, tips, tutorials, and opinions are 100% my own. Oh my… Virginia. You’re amazing, lady. Everything you do these days just seems to be so gorgeous. I’m in awe, friend. Gorgeous! I love the colours…so wintery and festive!! I popped over from your feature on Homework to see more of your absolutely gorgeous hutch. Lovely! This is beautiful. I love your arrangement of everything. You did such a great job decorating it! It turned out so pretty! Cute, cute, cute! I LOVE your color scheme! Thank you for sharing! PINNED! Thanks Michelle, so glad you liked it! Holy Cow! I want you to shrink wrap that entire hutch and mail it to me! 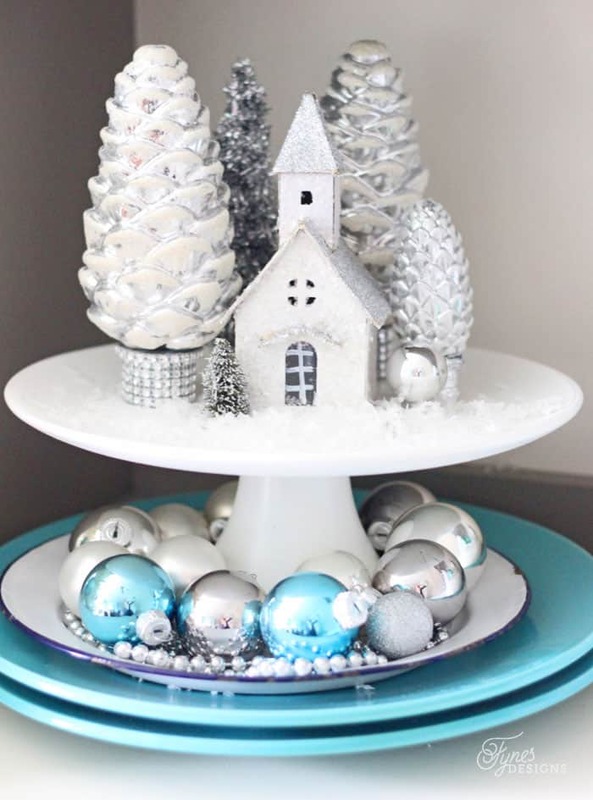 I love all the layers you added and the Christmas pinecone trees are fabulous! Oh my goodness. You know I’m obsessed with this because these are my absolute favorite colors! Please say you have linked up to Your Designs This Time so I can share it! I LOVE this! Oh my that is so beautiful. 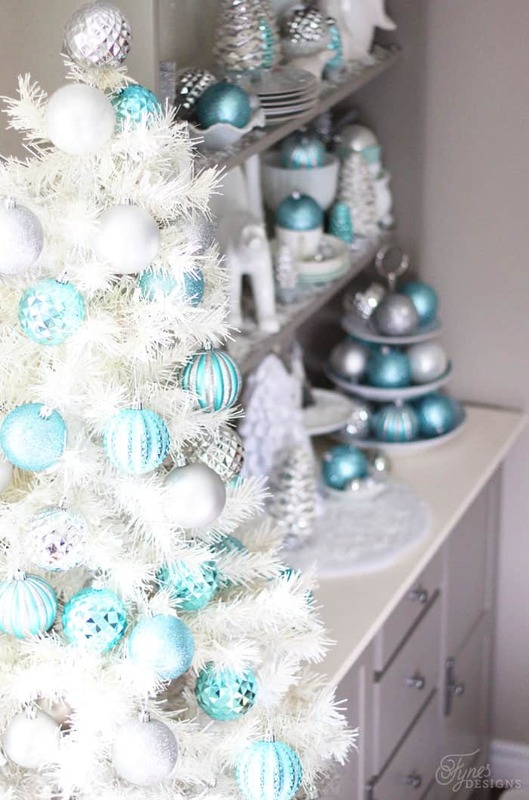 The white, silver and turquoise are so striking. And I love the hutch too! This is so, so pretty, Virginia. Love all the sparkle and love what you did with the pine cone ornament. Wanted to let you know that your hutch will be featured at The Scoop tonight. Thank you for linking up! Love your hutch! The colors are beautiful. I love the blue and the silver. Thank you for linking up to The Creative Exchange. We will be featuring your project this week!